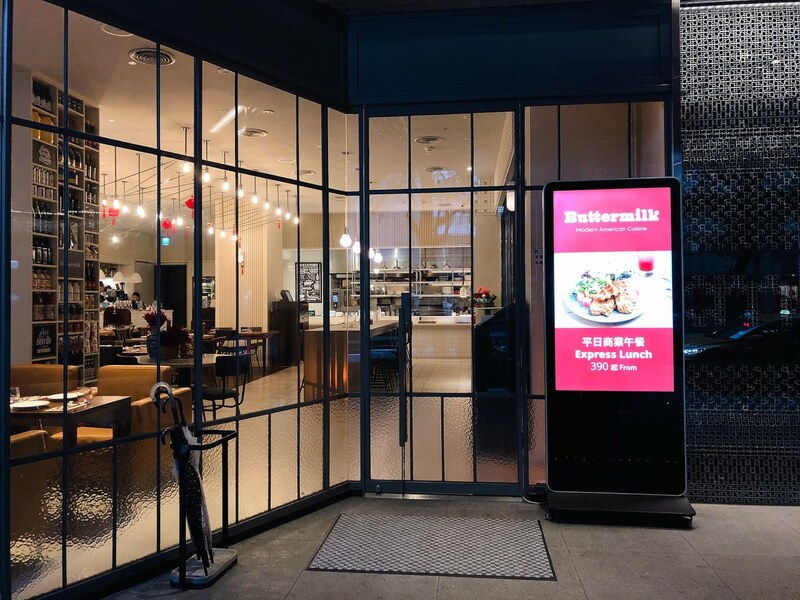 Buttermilk 餐廳是台北中山意舍酒店餐廳 , 是中山站美式餐廳之一, 這次有這個榮幸可品嚐到眾所皆知的美國阿嬤秘方炸雞. Buttermilk Taipei is located inside amba Taipei Zhongshan Hotel. 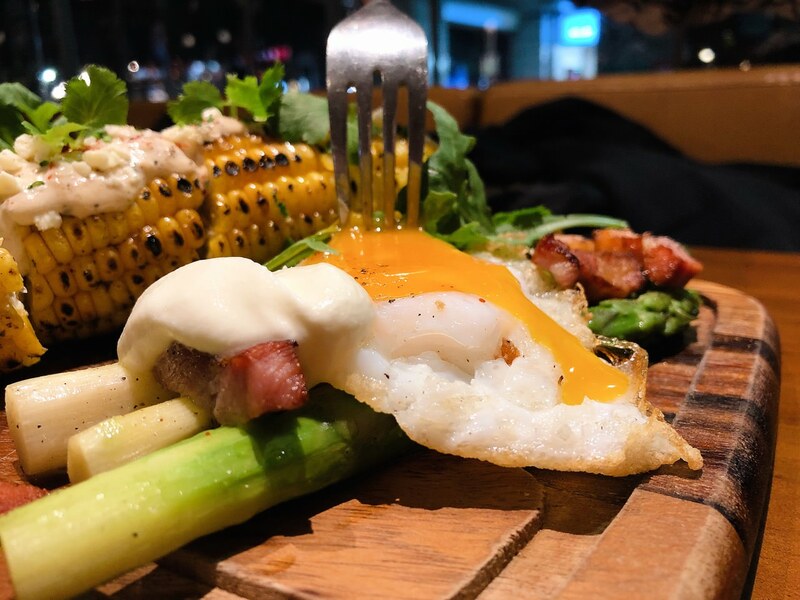 It is one of the American restaurants near Zhongshan MRT station. 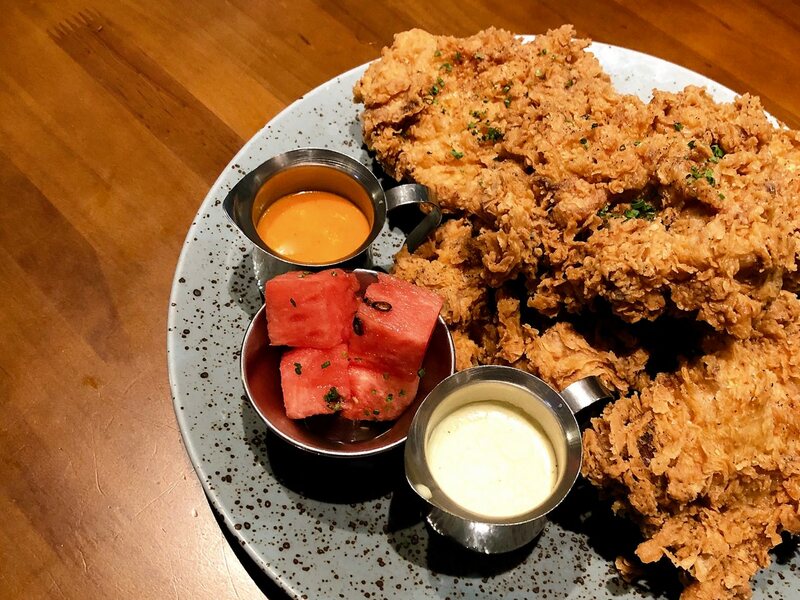 I have the opportunity to try out their Grandma’s Buttermilk Boneless Fried Chicken dish. 2017 年新開幕的Buttermilk 餐廳地理位置介於中山捷運站和雙連捷運站中間, 若是從中山捷運站走, 建議從三號出口往中山北路晶華酒店方向走即可. 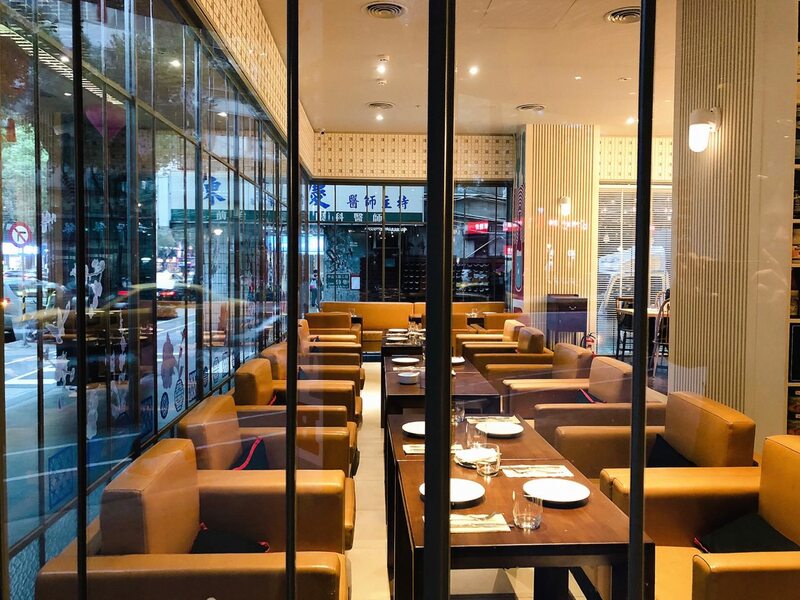 若是從雙連捷運站, 建議從一號出口往 “A Cut Steak House” 的國賓飯店走即可到達Buttermilk 餐廳. 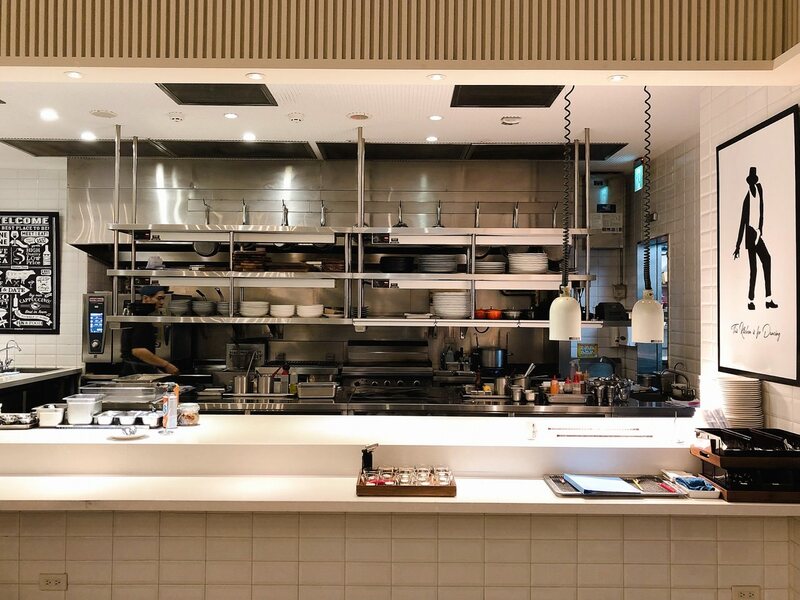 2017 newly-opened Buttermilk Restaurant location is in between Zhongshan or Shuanglian MRT station. If walking from Zhongshan MRT station, the closest exit would be No. 3 exit. However, if from Shuanglian MRT station, the closest exit would be No. 1 Exit. You would need to walk toward “A Cut Steak House” in order to arrive amba Taipei Zhongshan Hotel. 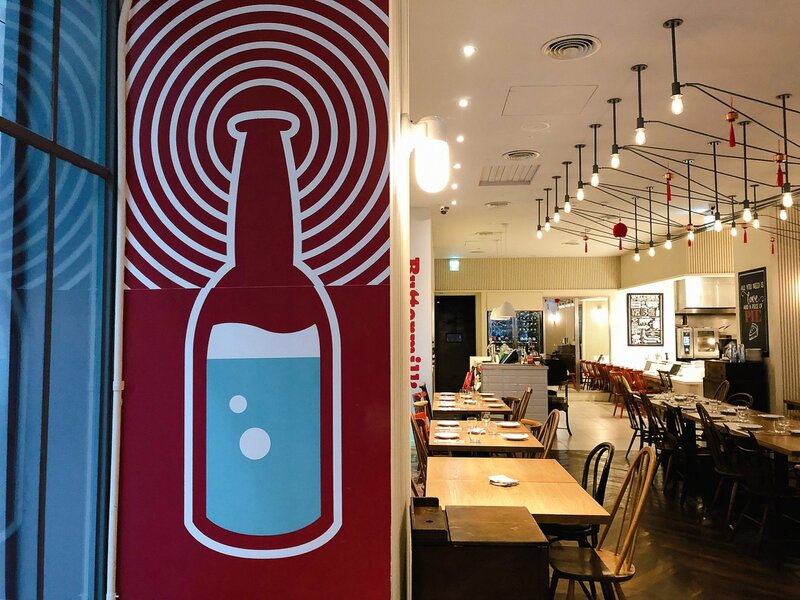 直接從中山意舍酒店正門進入餐廳, 有別於 “Hooters” 或是其他餐酒館 ,Buttermilk 餐廳裝潢相當明亮, 以亮紅與純白色調為主, 除了舒適沙發區外, 其他可移動座位則是適合部門聚餐或是大家庭聚餐, 文末影片有更詳細的餐廳內部裝潢, 最引人注目的莫過於整齊擺滿知名進口品牌調味料 (例如 Taobasco Sauce) 的展示櫥櫃, 酒櫃和單杯酒機器擺設在開放式廚房旁. 也欣賞餐廳裝潢的同時也能嗅到迷人炸雞香氣. 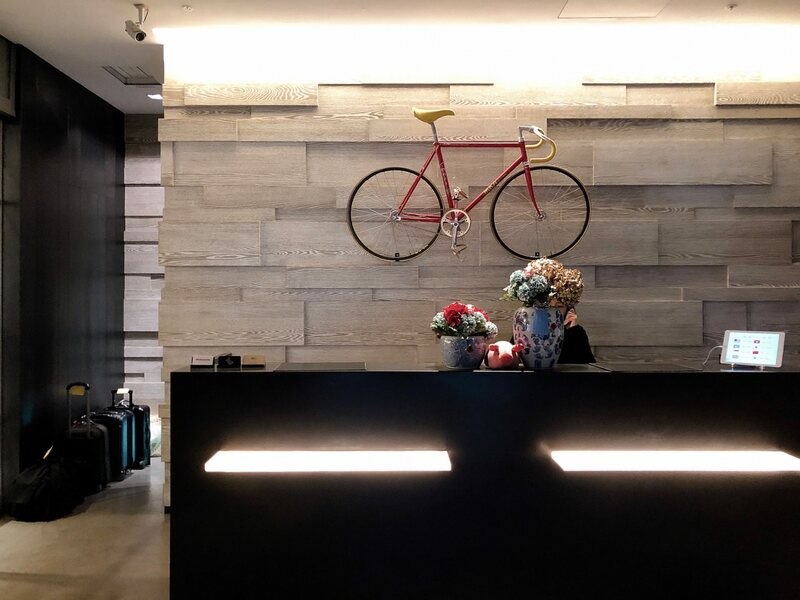 You would need to pass the small lobby of amba Taipei Zhongshan Hotel and turn left to enter Buttermilk Restaurant. The indoor design is bright and dominates by bright red and white color. Besides the comfortable sofa areas, there are also quite a lot of tables and chairs. It is suitable for department staff dining or family gathering. 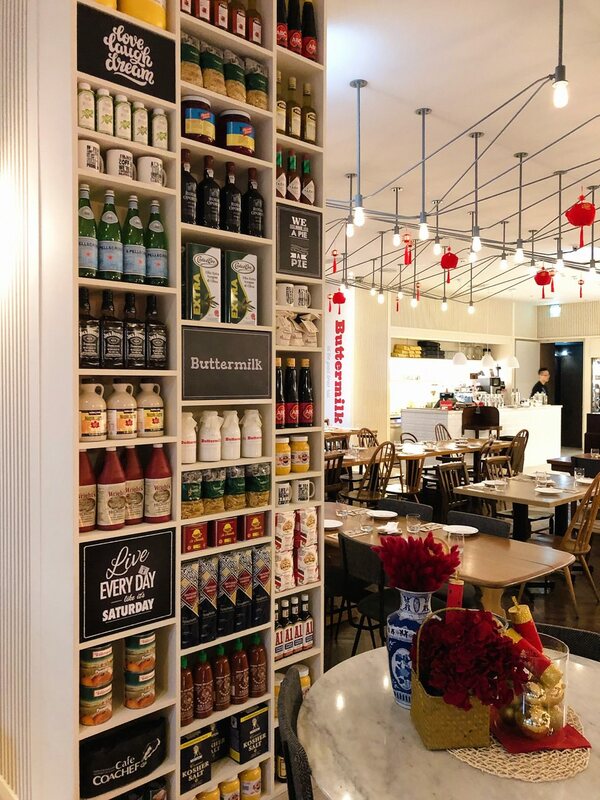 The showcase, which is full of imported flavoring (such as Tobasco) , caught my attention. 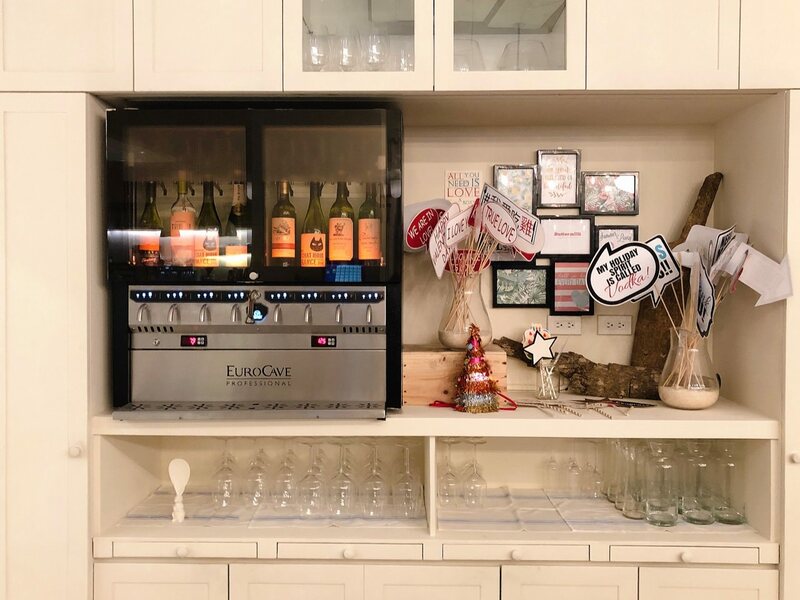 The single glass wine machine and wine display is near the open kitchen. 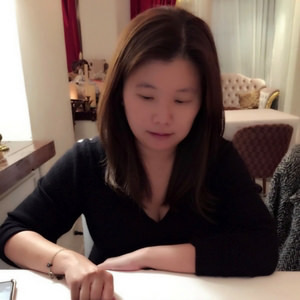 近年因為 Netflix 有許多國外美食節目, 讓台灣人開始認識美國南方料理, 除了 比司吉 (Biscuit) 和 南方香料雜燴湯 (Gumbo) 外, 獨特炸雞也是在南方美食名單上. 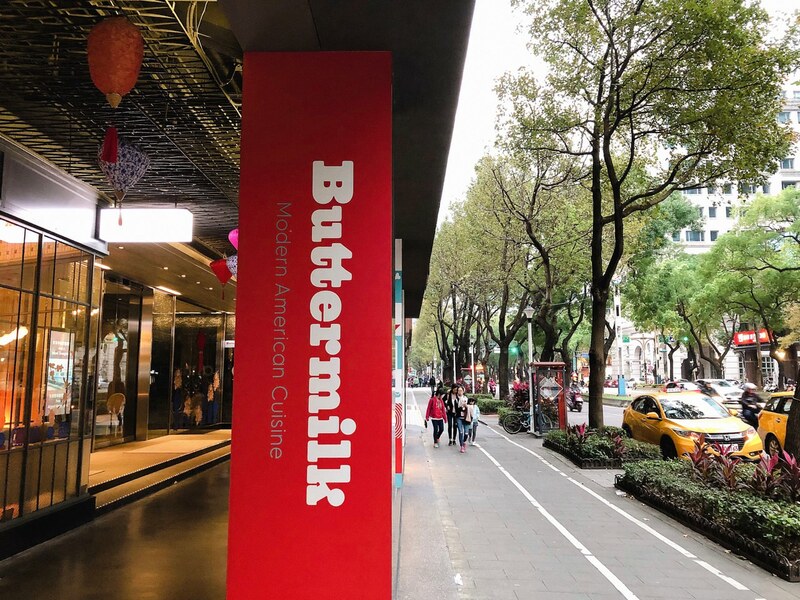 Buttermilk 炸雞除了用香料醃泡入味外, 多了浸泡 Buttermilk (酪乳)步驟, 讓肉質更嫩. 美國阿嬤秘方炸雞 (5 塊) 單點價格為 NTD $550,以前 Buttermilk 炸雞裡有雞翅, 雞胸和雞腿三種部位, 2019年的 Buttermilk 炸雞則是一律無骨雞胸和雞腿, 小朋友吃起來也安心. Recently, there are lots of Foreign Food Show at Netflix channel. 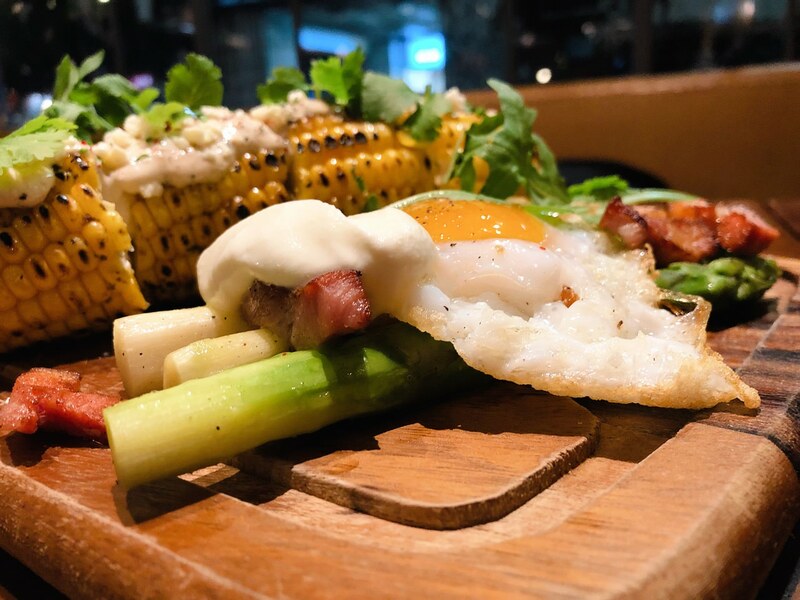 Most Taiwanese start to know the classic America Southern Cuisine. 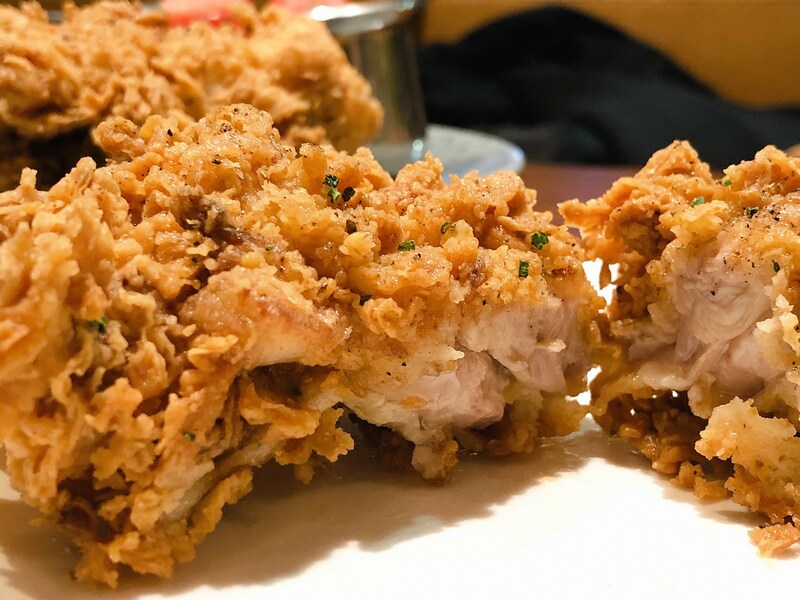 Besides Biscuit and Gumbo, the buttermilk fried chicken is also famous. 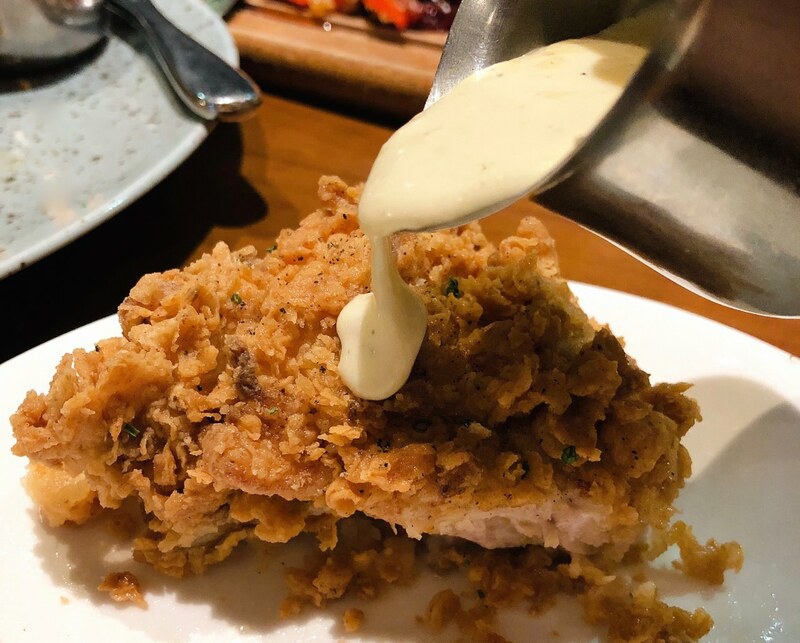 The chicken is bathed with different types of flavoring and buttermilk. The meat would be much more tender than others. The 5-piece single dish price is NTD $550. The previous version has chicken breast, chicken leg and chicken wings. The 2019 version has only boneless chicken breast and chicken leg. Buttermilk 炸雞並非像 “起家雞韓國炸雞”如塊狀, 而是外型像豪大雞排攤平, 與天母 “美墨炸雞“ 一樣有豪邁不修邊幅的金黃色表皮, 我對這種炸雞表層情有獨鍾, 一刀切下除了ㄎㄠˇ 一聲外, 雖然沒有浮誇爆汁, 但可明顯看到發亮油脂從雞肉表層緩緩流出. 品嚐時, 在脆亮聲響裡, 聽覺挑逗食慾, 舌尖有同時感受到微蒜粉和少許香料, 但隨後被肉香與油脂覆蓋著, 即使嘴角都是油脂留下的痕跡, 我完全不在乎. 我分別輕沾乳白色蒜味乳酪醬和霹靂紅辣醬 (Tabasco 與其他香料調製) , 兩款沾醬皆是重口味, 濃郁蒜香或是酸辣度破表個性顯明的沾醬, 皆看個人喜好, 一旁西瓜可緩衝辣味, 我基本上偏好原始風味, 也就是不沾醬, 總之, Buttermilk 炸雞確實令人難忘. 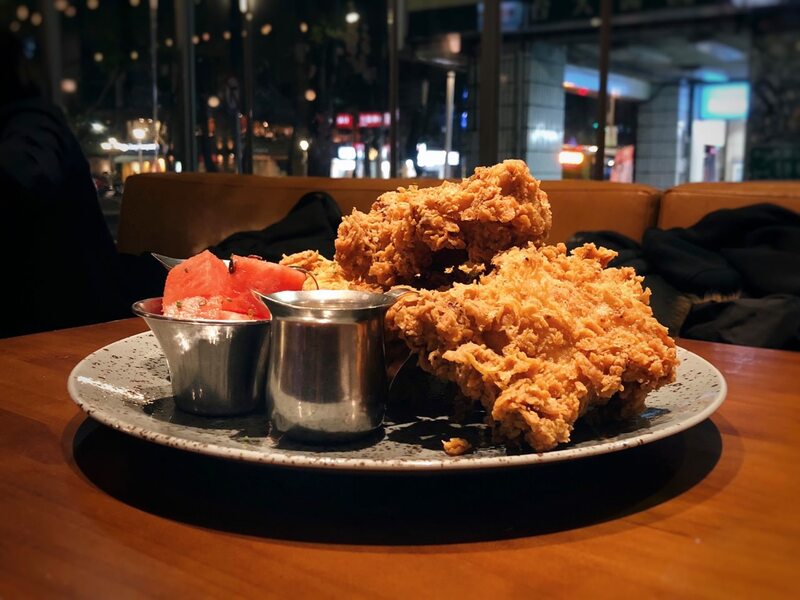 Different from “Cheogajip Korean Fried Chicken”, the appearance is actually a bit flat. 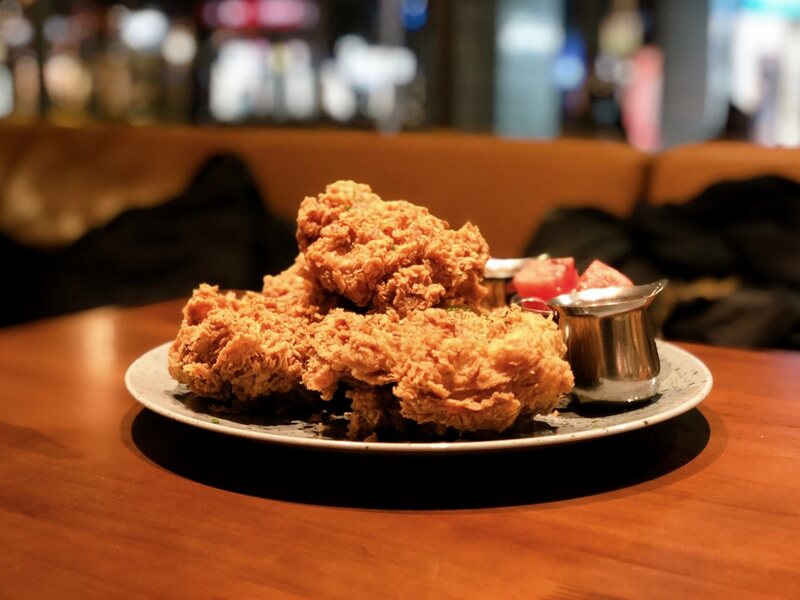 The fried chicken has the same golden and crispy skin like “Ranger Fried Chicken” at Tianmu. While cutting, the crispy sound is delightful. And the fats along with the tender meat is delicious. I can also taste hints of garlic and small amount of flavorings. The restaurant offers two types of dip sauce- garlic cheese sauce and cajun spicy dip sauce. The refreshing watermelon could decrease the spicy stimulation. I personally prefer the original flavor, which is without any sauce. I would definitely recommend this dish! 店員告知廚房用的原木跟 “ Wildwood” 一樣是用龍眼木, 眾多菜餚擺置在木盤上, 我對烤美國大蘆筍最感興趣, 我上次吃大蘆筍是在 “星高湯廚房 Soupstar The Kitchen”, 我朋友將半熟有機鴨蛋戳破流出, 與店家自製 Ricotta Cheese 融為一體, 絲毫不會影響到蘆筍脆嫩度, 在煙燻培根陪襯下顯然更成為這整盤的主角. The staff mentioned that Buttermilk Restaurant uses woods to grill, just like “Wildwood”. I am mainly interested in grilled asparagus. Last time I ate large size asparagus is at “Soupstar The Kitchen”. The duck egg yolk and ricotta cheese mixed well together. It doesn’t affect the crispy and tender texture of the asparagus. Pairing with smoked bacon would definitely upgrade this dish. 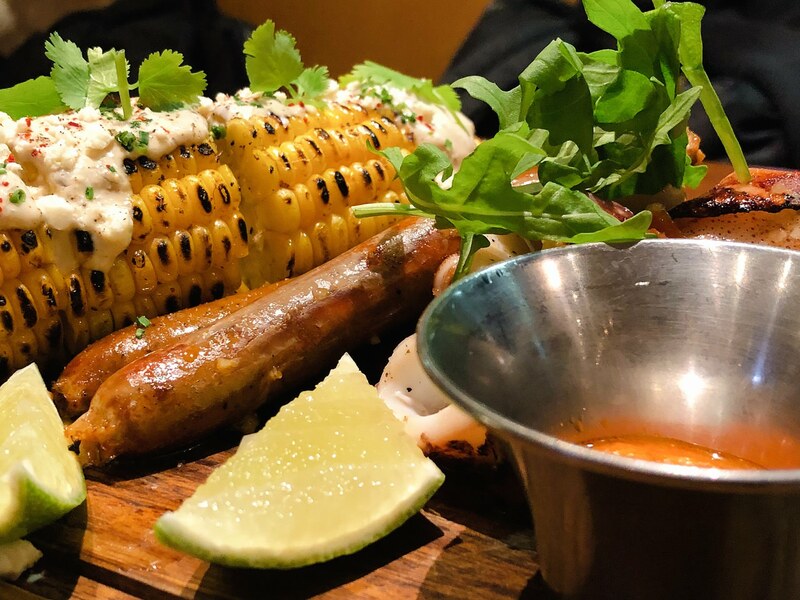 What is Tex-Mex grilled corn? It is regarding the Mexican Chipotle Butter and its Texas grilling method. 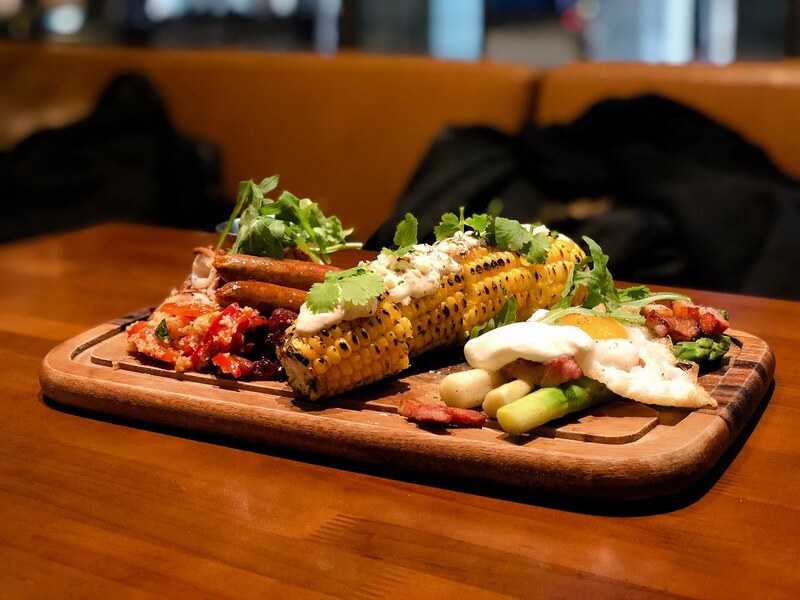 Before grilling, the restaurant would steam the corn in order to keep the corn juicy. 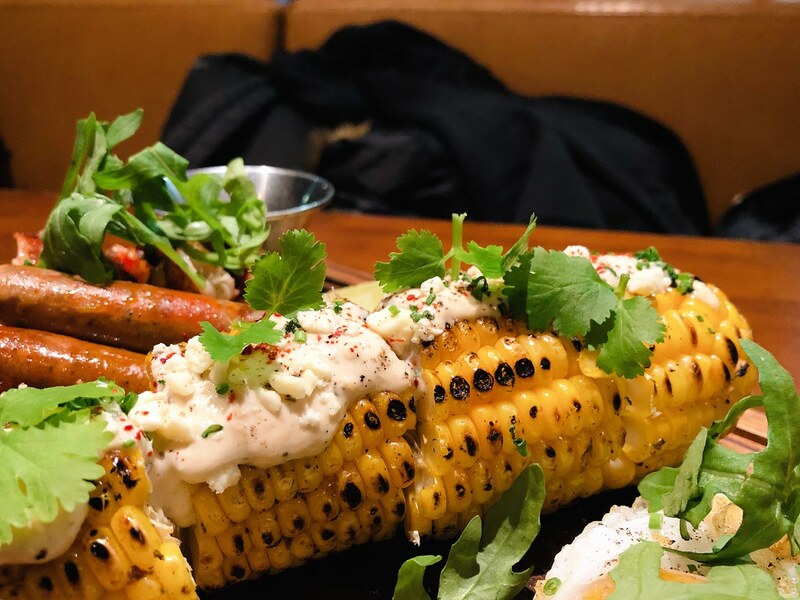 Then the chef would spread the Chipotle Butter on the corn appearance and grill. I was expected spicy long-lasting stimulation. However, it only has hints of spicy flavor. 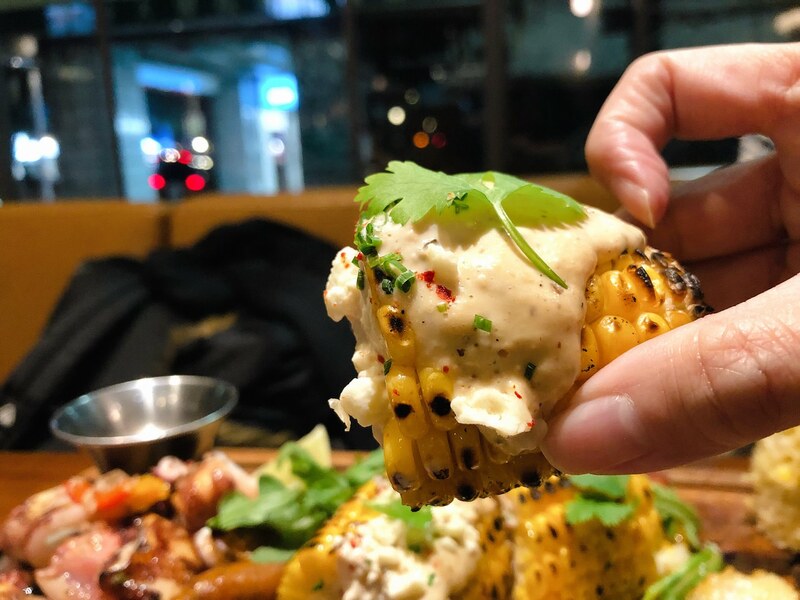 The juicy corn pairs great with the sour cream-lime dressing. Simply and yet delicious flavor would be a great description of this corn. 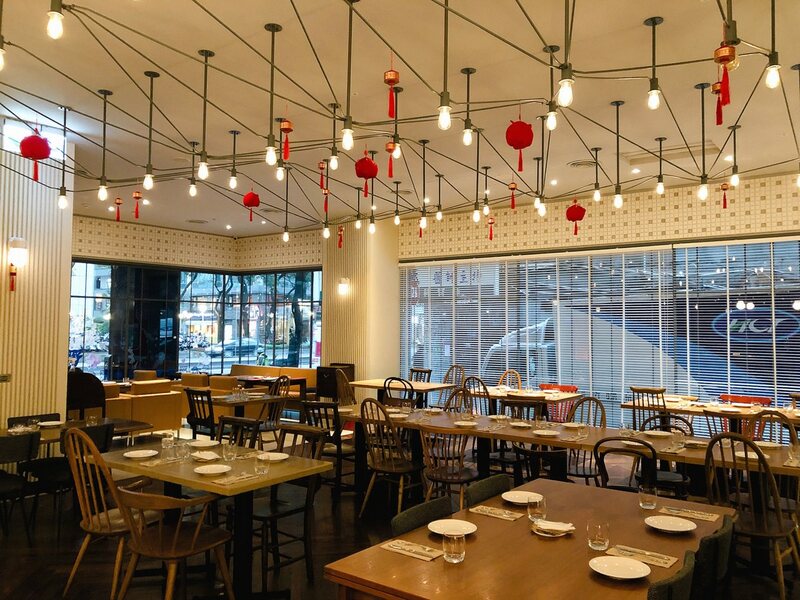 上次吃烤小卷是在 “Naked Bistro 裸餐酒”, Buttermilk 餐廳的烤東港小捲口感偏嫩, 味蕾先感受燒烤香氣與蒜味, 油醋隨後帶來的酸度與雪莉醬賦予的甜度推疊起多層次風味, 可惜北非小米 (Cous Cous) 卻因為雪莉醬而變得偏軟爛, 幾乎快感受不到米心. 至於飽含特殊香氣的手工北非羊肉香腸, 北非香料 Harisa 常被用在摩洛哥料理, 目前尚未習慣這款獨特茴香與芫荽子混和風味, 我會建議加一旁的檸檬平衡風味. Last time I ate grilled squid was at “Naked Bistro”. 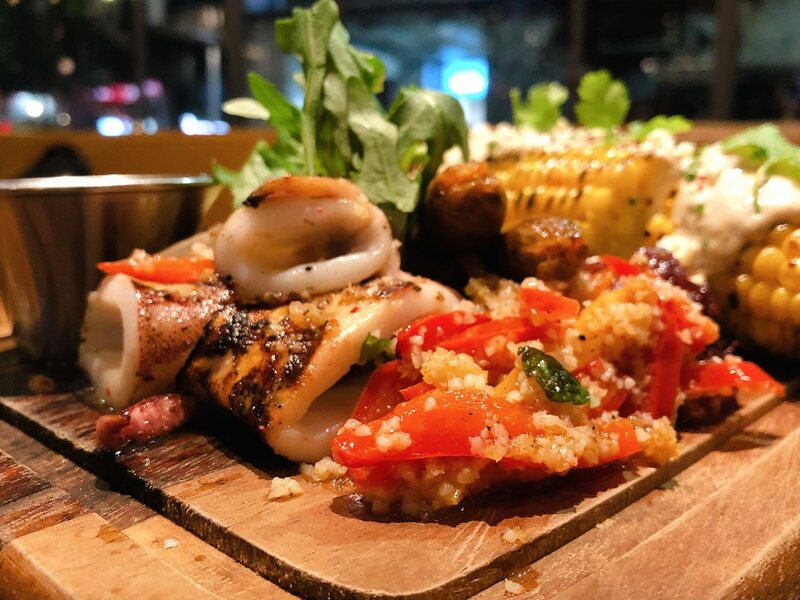 Buttermilk restaurant’s grilled squid is much more tender than others. The tastebuds would sense the typical grill flavor and hints of garlic flavor. The sweet from sherry and acidity from vinaigrette sauce would bring this dish different types of flavors. As for the Grilled Lamb Sausages, I wasn’t familiar with Harissa spice. I only know that the spice include coriander seeds and cummins, which are mostly seen at Morocco cuisine. I would suggest to squeeze some lemon juice into the dish to balance. 此為單點料理, 比司吉 (4個) 單點價格為是 NTD $200.之前我常搞混美國比司吉 (Biscuit) 和 英國司康 (Scone), 我那時的分辨方式是比司吉 (Biscuit)是在 KFC 吃的, 司康 (Scone) 是在 “Smith & Hsu” 吃的. 實際上美國比司吉 (Biscuit) 麵粉奶油比例比較像麵包, Buttermilk 餐廳則是專求經典作法再加入 Buttermilk, 單獨品嚐時, 鹽味與濃郁奶香融合相當不錯, 不虧是 Buttermilk 餐廳招牌料理, 抹上有藍莓顆粒的醬更是增加甜度, 美中不足的的方式奶油沒有事先加熱, 奶油偏硬導致難挖. This particular single dish price would be NTD $200. Back at the time, I honestly have difficulties to remember the difference between American Biscuit and English Scone. In fact, the flour and butter percentage of the Biscuit is a bit like bread. 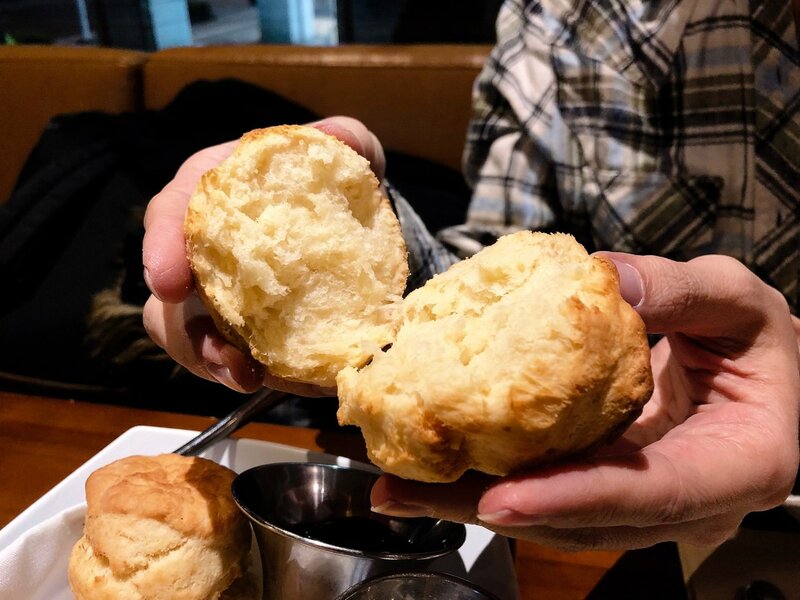 Buttermilk restaurant adds buttermilk while making the biscuit. The buttery flavor and hints of salty flavor is perfect and delicious without any jam. 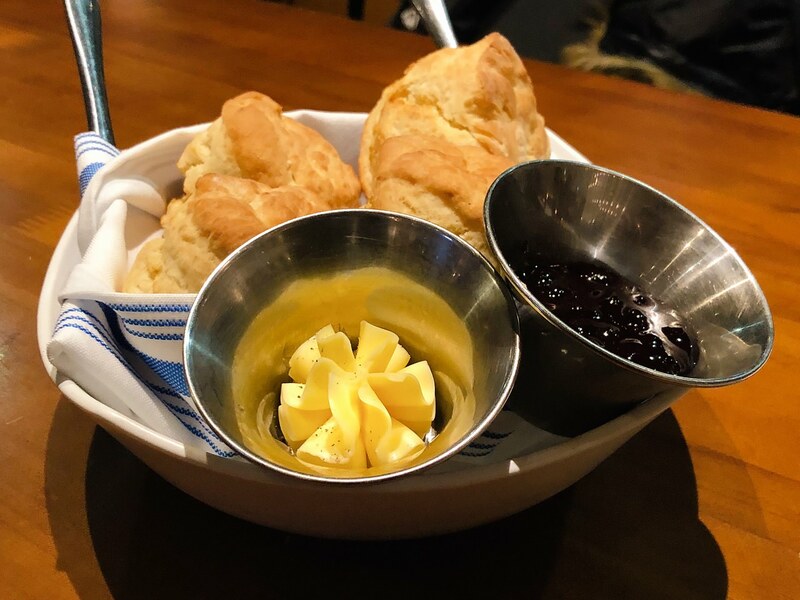 Buttermilk restaurant offers yummy self-made blueberry jam and butter. However, the butter is a bit difficult to spread since it is not pre-heated. 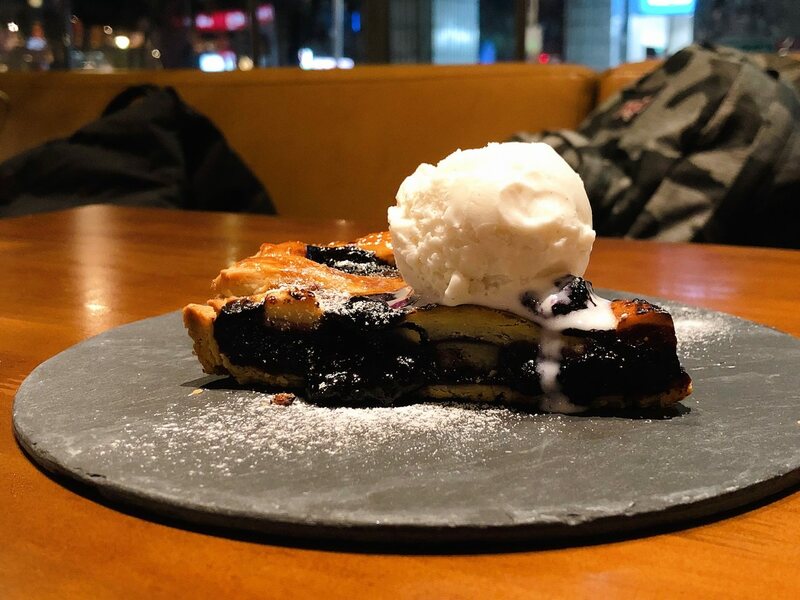 Last time I ate Blueberry Pie is at “Anitco Forno Bistro”. Both classic pie appearance looks similar. The pie crust itself is dense but full of buttery flavor. 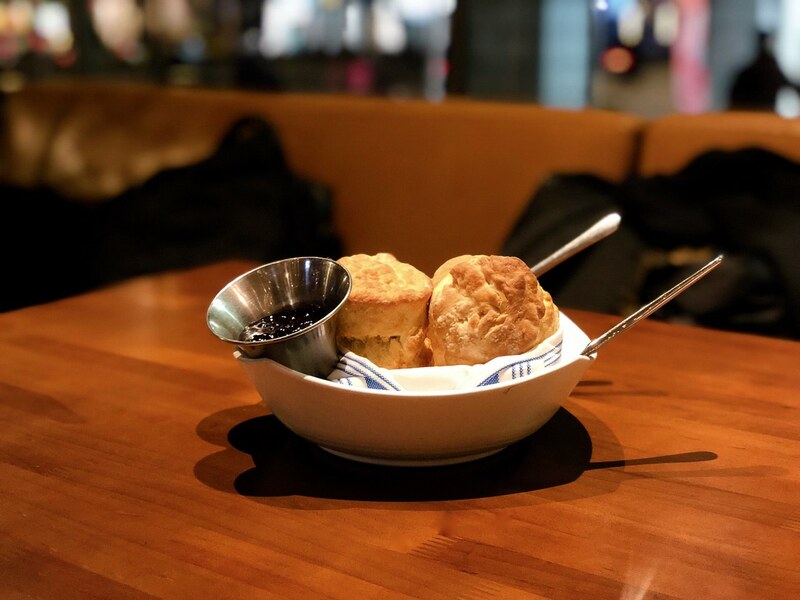 The blueberry jam is definitely sweet. 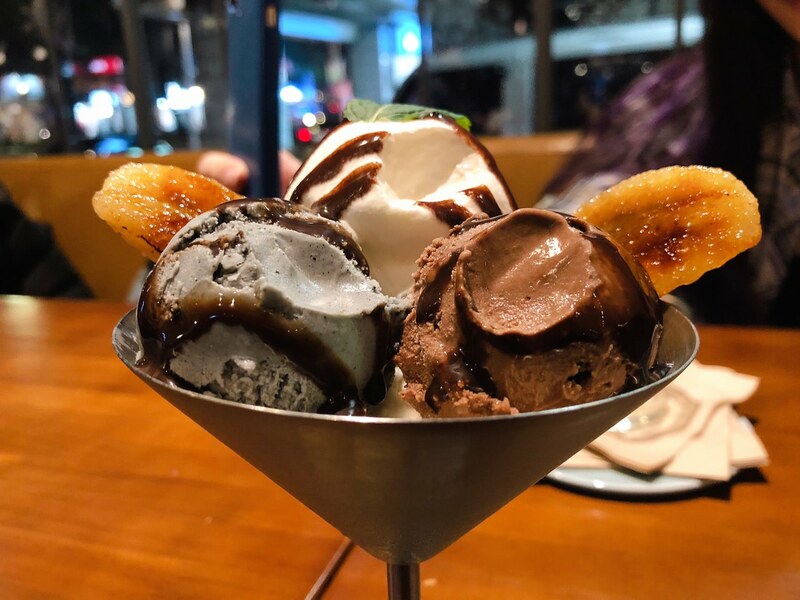 I would suggest sharing this dessert with 4 people. I would recommend this dish to people who never try the classic blueberry pie. 手工冰淇淋聖代的三種口味會不定期更換, 這次吃到的是香草, 芝麻和巧克力口味, 香草冰淇淋隱約可看到香草籽, 滑順不易融化, 在 “明水然鐵板燒”吃的焦糖香蕉片則是成為這道甜點的配角, 若是與現烤藍莓派相比, 我會推薦較少見的溫熱藍莓派. The three flavors sundae would change sometimes. My friend and I tasted vanilla, sesame, and chocolate flavor. We saw the vanilla seed at the vanilla ice cream. It is not easy to melt, which is great. 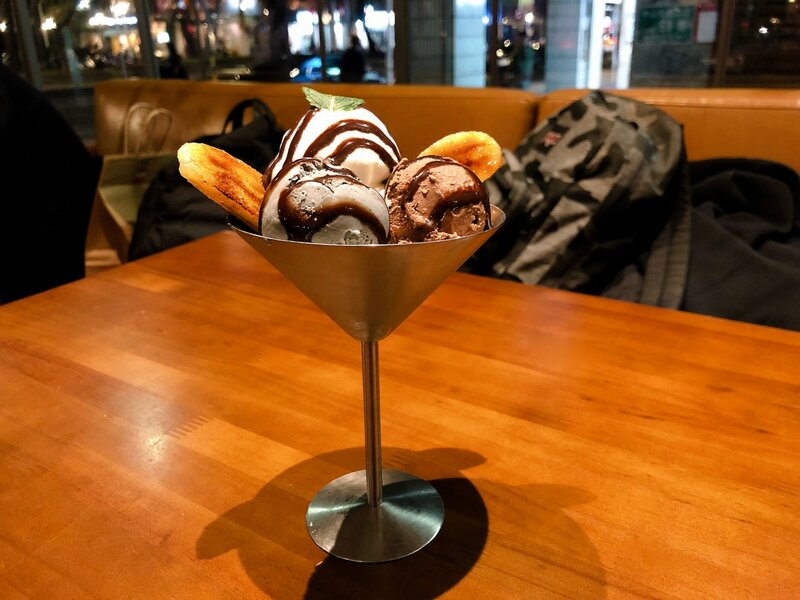 The caramelized banana piece, which I tasted at “Minsui Zen Teppanyaki”, becomes the side dish of this dessert. 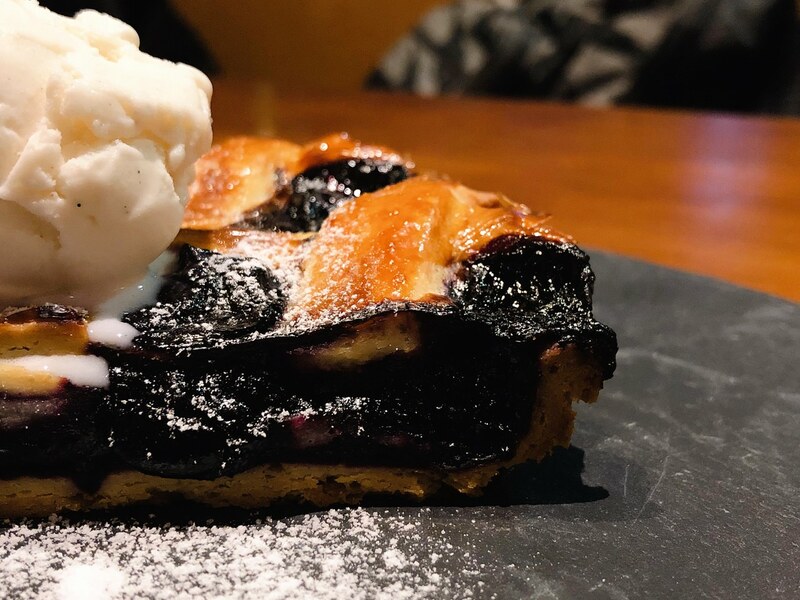 If choosing sundae and blueberry pie, I would suggest the blueberry pie. Buttermilk 餐廳酒單上有販售單杯酒, 較特別的是有單杯氣泡酒, 但當下我跟朋友皆點在 “FIELD 小田食光“ˇ也喝得到的氣泡飲, 兩款Buttermilk 的氣泡飲各自有檸檬酸甜感和莓果顆粒感. Buttermilk Restaurant wine list has single glass wine. Surprisingly, they offer single glass sparkling wine. 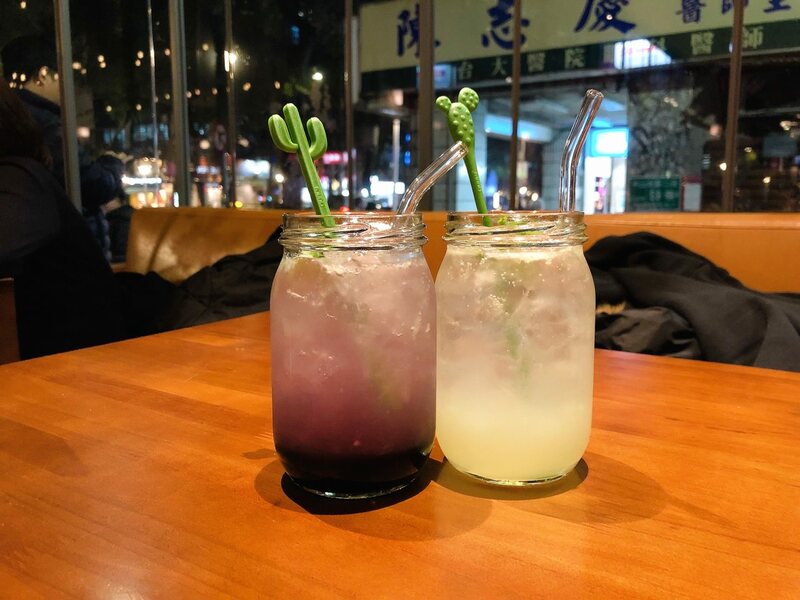 My friend and I ordered the sparkling drink, which are mostly-seen at “FIELD Cafe”. Each sparkling drink has its own character. The lemonade has both acidity and sweetness flavor. The blueberry has acidity and fruity flavor.